This is the 5th and last part of the project, "Can I Install Tern Handlepost/Fork on Dahon Frame?". 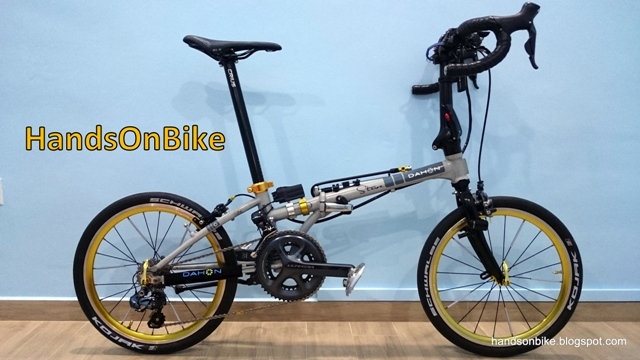 Continuing from the previous part of the project, where I completed the installation of the Tern handlepost and fork onto the Dahon Boardwalk, this final post will wrap up the whole project. As stated at the end of the previous post, I encountered a steering problem when I test rode the bike after installing the Tern handlepost and fork. It is kind of difficult to describe the problem clearly in words, but I will try. Normally, a small wheeled bike such as my Dahon Boardwalk will have a more nimble steering feel as compared to bikes with standard wheel sizes. However, test riding the newly upgraded Dahon Boardwalk felt really strange. I found it difficult to keep the bike travelling straight even on a straight and smooth road. The bike tends to auto-steer to the sides, and it was taking a lot of effort to keep the front wheel pointing straight. Having rode a folding bike regularly since 2008, I have a few years of experience riding small wheeled bikes, and I am familiar with the steering feeling. Although some bikes are naturally more twitchy, this felt different and wrong. It got so bad that after a while, I could not steer properly while riding! Upon steering to the side, the handlebar stayed to the side and did not want to return to the centre. Luckily, I was going slow and only test riding around the estate, so there was no great danger. At that point I knew that something was seriously wrong with the steering. My first suspicion was that the headset may have been tightened too much, causing the headset bearings to seize and stop rolling properly. However, even after I loosened the top cap inside the handlepost, the steering still felt stuck. The next step to troubleshoot this problem is to remove the handlepost, and see if I can spot any anomalies. Upon removing the handlepost, I noticed some wear on the gold coloured headset bearing cup. From the signs of wear that I spotted, I found that the edge of the handlepost base was rubbing against the headset bearing cup. This meant that the clearance between the handlepost base and the headset bearing cup is not sufficient to allow for smooth rotation. When there is no load on the handlepost (Eg. in the workstand), the handlepost can rotate smoothly. However, during riding, the load from my weight on the handlebars will close up the tiny gap, causing intermittent rubbing. This excessive friction eventually caused the handlepost to jam up and stop rotating properly. One way to solve this would be to grind away the bottom edge of the handlepost base, to create more clearance. However, since the handlepost is already assembled with the rest of the handlebar, it is too troublesome to remove the handlepost for grinding at the workshop. The other way is to add a spacer above the headset compression ring, so that the handlepost rests slightly higher. This will create more clearance between the base of the handlepost and the headset bearing cup. This spacer diameter is the same as a standard headset spacer, but they usually come in 5mm or 10mm thicknesses, which is far too thick. Therefore I sourced for thin headset spacers from Taobao. From what I see, adding just one 0.3mm spacer will create sufficient clearance to avoid rubbing. However, I took the chance to add back the rubber seal that was on the base of the Tern handlepost. Therefore, I chose the 1mm thick spacer and placed it on top of the headset compression ring. 1mm headset spacer on top of the headset compression ring. This will reduce the clamping length by 1mm. Rubber seal that comes with the Tern handlepost. It was previously removed due to insufficient clearance. After putting the Tern handlepost back onto the steerer tube. Slightly shorter clamping length, but it will have to do as there is nothing else I can do to increase the clamping length. Rubber seal can be seen between the base of the Tern handlepost and the gold headset bearing cup. This minimises the amount of rain and dust that enters the headset bearings. After making these adjustments, the steering feel of the Dahon Boardwalk is back to normal! The front wheel is now able to auto centre itself as designed, making steering much easier and natural, instead of me having to try so hard to keep the front wheel straight. Now that the Tern handlepost and fork has been mounted successfully on the Dahon Boardwalk with no issues, I can now add on more accessories to the handlepost and handlebar. One accessory that I want to add to the Dahon Boardwalk is the Shimano Sport Camera. The camera has previously been installed on the Merida Scultura 5000 road bike, using the K-Edge Go Big GoPro handlebar mount. If I want to mount the camera on other bikes, I would need to get additional mounts to allow quick and easy transfer of the camera from bike to bike. However, the biggest problem here is that the K-Edge mount is really expensive! From Taobao, I found similar GoPro mounts at a fraction of the cost. They may not look as nice as the original K-Edge mount, but they have the same function and are much cheaper. GoPro handlebar mount from Taobao. Looks almost the same as the K-Edge version. Same as on the K-Edge mount, I moved the mounting piece to the top of the mount. As there is no more space on the top of the handlebar for mounting this GoPro mount, I mounted it sideways on the Tern handlepost. Although the camera will be tilted to the side, the camera is able to auto rotate the video to the correct orientation. As seen from the front. Loads of accessories! The Controltech Stem is tilted slightly forward to put the handlebar at the correct reach. This is because the vertical part of the handlepost is further back as compared to Dahon/Fnhon handleposts, due to the taller handlepost base. Tern handlepost locking lever with the green protective sticker removed. Looks very glossy and elegantly designed! Final view of the upgraded Dahon Boardwalk with the Tern handlepost. Yet another project completed successfully! Through this project, I have learnt much about the design, construction and installation of the Tern handlepost. As for the ride quality, I have not detected any large improvement in handlepost stiffness, as the previous Fnhon 27cm 4 bolt handlepost is already very stiff. In fact, when I pull hard on the handlebar, I can feel some flex coming from other parts of the bike, such as the long seatpost and the main folding joint on the frame. The stiffness of the bike frame and handlepost is probably as good as it gets with this Dahon Boardwalk frame. cool post - that's a lot of work that you did. One comment - please make sure that your handlebar is specifically designed to work with the ControlTech stem. Your bar should have a wider internal butting for proper strength. If you just use a standard bar, it will only be thick butted in the middle where a standard stem would attach. Thanks for the good advice! Great to see you reading my blog. Can you comment on the fold with the new handlepost? I am aware that the Tern post will fold to the outside. Now, when you fold the bike, do the magnets line up? I can't imagine that they will but I would like to know. How is the fold in general? Better? Worse? I'm guessing it is better with your drop bars. Great work and great site. Depending on whether you fold the handlepost first or turn the front fork first (N-fold), it can be an inside fold or outside fold. The magnet no longer works as it does not line up with the front fork, as it is on the other side. I eventually removed the magnet system. Folding with drop bars is always not ideal as it makes the folded package very wide. 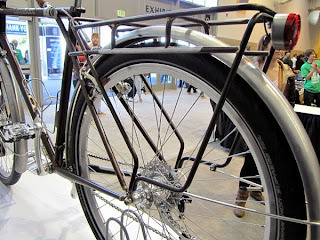 If a compact fold is desired, flat handlebars are much better. Fascinating that a tern handlepost can fit on a dahon frame, but can a dahon jetstream handlepost fit on a Tern bike (verge x10)? I think can, but need to cut short the steerer tube on the Tern fork. Have you tried putting the headset upper cover and not using the tern rubber seal instead? Using the upper cover of the headset will raise the entire handlepost higher as the base of the handlepost rests on the cover.